Car enthusiasts must go for the new 2014 Nissan Versa Note – the new hatchback in the line-up of eco-friendly low-emission vehicles. The recently launched car is packed with advanced technological features. The four cameras in the car create a 360 degree virtual image of the vehicle which gets displayed on the touch screen monitor on the dashboard. The 360 degree view of the car makes it easy to move and park in busy parking lots. The new Nissan Versa Note has a lot of legroom and headroom. The car is the ultimate example of comfort and convenience with 60/40 split rear sears and tire pressure monitoring system. The NissanConnect navigation system in the car provides live traffic and weather conditions. In addition to that, the system provides hands-free communication and streaming audio. However, the car has been launched with only one engine choice – 1.6 liter engine with 109 HP and 107 lb-ft of torque. 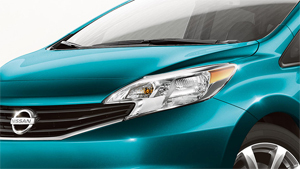 2014 Nissan Versa Note comes with a long wheelbase of 102.4 inch. In addition to that, the car looks stylish and chic with large halogen, multi-reflector headlights. The rear lights are with aero flares, which improve aerodynamics. The car also features a deep front fascia with grille. The car’s most notable features include steep windshield, sculpted doors, and aerodynamic styling. The Versa Note is available in a range of several exterior colors like Magnetic Grey, Super Black, Brilliant Silver, and Aspen White. So, choose the color that matches your style the best and flaunt your new Note. The new Note comes with advanced 1.6 liter, 4 cylinder engine with dual fuel injection. The car also features twin CVTC (Continuously Variable Timing Control). In addition to that the car has 5-speed manual transmission. It is claimed to be one of the most fuel-efficient cars with a mileage of 40mpg on the highway and 31 mpg in the city. The car has provision to carry 5 passengers. The total interior volume of the car is 115.5 cubic feet. The car has the best-in-class cargo space of 21 cubic feet. The interior is versatile with a Divide-N-Hide Adjustable Floor. The car has enough space to carry you and your luggage comfortably. The generous dimensions of the interior allow the car to include more of safety features and other accessories like dual stage front airbags, driver and passenger seat-mounted and side-impact airbags, and roof-mounted curtain airbags. One of the main reasons behind low fuel efficiency is under-inflated tires. However the new 2014 Nissan Note leaves no scope of deflated tires as it is equipped with TPMS system. When there is less tire pressure, the car will indicate the low air levels to the driver. Again, when the air in the tire is full, a beep sound is heard to notify that the tires have enough air now. Remember, tires with enough air can also help to reduce the chances of accidents. Another safety system in the car is the TCS or Traction Control System. When there is a drive wheel spin, throttle is automatically reduced and the brake pressure is adjusted accordingly. In addition to that the anti-lock braking system or ABS works wonderfully in panic-braking situations. Thus, when you need to brake suddenly on ice, you know the ABS will prevent any fatal accidents. In addition to that the car features safety systems like Electronic Brake force Distribution and VDC or Vehicle Dynamic Control. As discussed already, as a standard safety feature, the car also features advanced air bag system and safety belts. If you are planning to buy the new Note, you must know that it starts from the base price of $14, 780.